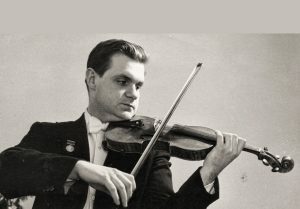 Rudolf Barshai (1924-2010) was a Soviet and Russian condutor and violinist. He founded the Moscow Chamber Orchestra in 1955, and was its leader and conductor until 1977 when he left the USSR. 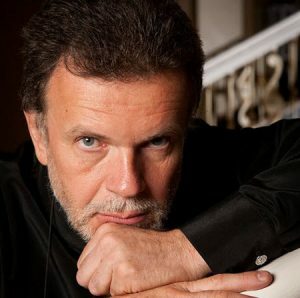 From 1977 and onward, he worked as a conductor in many different countries, and was for instance the artistic director of the Israel Chamber Orchestra as well as the principal conductor of the Vancouver Symphony Orchestra and the Bournemouth Symphony Orchestra. During his career in the USSR, he and the Moscow Chamber Orchestra won numerous Soviet musical competitions and recieved may awards. He became highly acclaimed both within and outside the USSR for his skills not just as a conductor, but also as a musical interpreter and arranger. Among other things, Barshai is renowned for his arrangements of Dmitri Shostakovich’s string quartets for chamber orchestra, including String Quartet No. 8. He and Shostakovich were close collaborators, and the Moscow Chamber Orchestra, conducted by Barshai, recorded many of Shostakovich’s works. 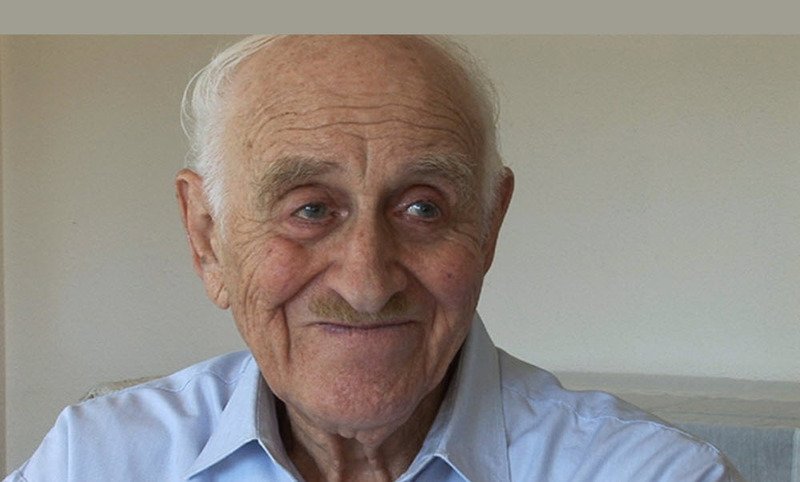 Rudolf Borisovich Barshai was born on 28 September, 1924, in Stanitsa Labinskaya, a town located in the North Caucasus region of southern Russia, not far from the Black Sea. He moved to Moscow to study music at the Moscow Conservatory, where he was tought by Lev Tseitlin and Vadim Borisovsky. 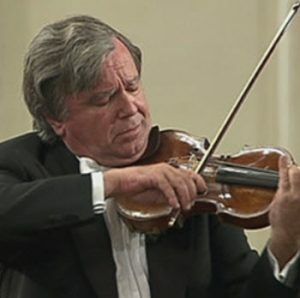 While still a student, the 21-year-old became an early member of the Borodin Quartet in 1945, although until 1955 it was known as the Moscow Conservatoire Quartet. 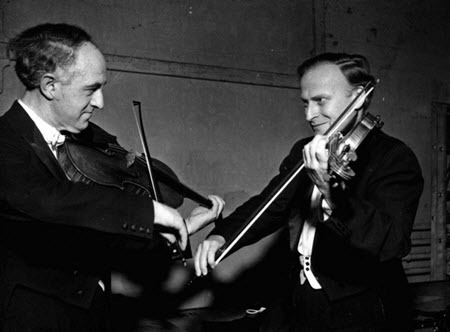 The original viola player of the quartet was Yuri Nikolaevsk, but he was soon replaced by Barshai. Even after graduating from the conservatory in 1948, Barshai remained with the Moscow Conservatoire Quartet until he resigned in 1953 to study under the famed conductor Ilya Musin at the Leningrad Conservatory. Rudolf Barshai founded the Moscow Chamber Orchestra in 1955 to pursue his dream of being a conductor. The orchestra quickly became very highly regarded in the USSR and other parts of the Eastern Bloc, and eventually also got a chance to perform outside the Soviet-sphere. Barshai led and conducted the Moscow Chamber Orchestra until 1977, when he left the USSR for a life in the West. 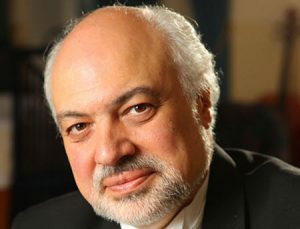 Barshai was the artistic director of the Israel Chamber Orchestra from 1978 to 1981. In 1981-1982, he was the principal conductor of the Vancouver Symphony Orchestra in Canada. In 1985-1986, he was the principal guest conductor of Orchestre National de France (National Orchestra of France). 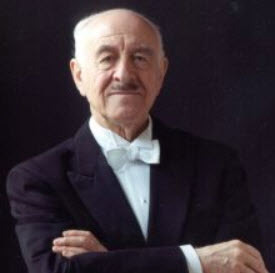 Barshai also served as a permanent Guest Conductor with many orchestras around the world, including prominent ones in Europe, United States, Canada, Taiwan, and Japan. Toward the end of his life, he lived in Basel, Switzerland, with his wife Elena Raskova. He died there on 2 November, 2010. Elena Raskova, from 1980 to his death in 2010. Barshai’s first wife was Nina Barshai, the second violinist of the Borodin Quartet. They had a son, Levi Barshai, together in 1946 and married the following year. The marriage ended in 1953. In 1954, Barshai married the Russian painter and costume designer Anna Martinson. Their son Walter Barshai was born in 1955. In 1963, the couple divorced. In January 1967, Barshai had a son named Takeshi with the Japanese translator Teruko Soda. Barshai and Soda married in 1968 and the marriage lasted until 1974. In 1980, Barshai married Elena Raskova, a harpsichordist and organist. Their marriage lasted until his death in 2010. The Note is a biographical film about Rudolf Barshai, made in 2010 by Oleg Dorman. In 2015, the English label ICA CLASSICS released a 20-CD memorial compilation called Tribute to Rudolf Barshai. In this section we profile different Russian who have become international successes. Alexander Kostritsyn is a successful Russian poker player who has won more than $3,000,000 in tournament play and a lot more at cash tables. Alexander Kostritsyn was born in 1986 and his rise to prominence started when he was about 20 years old. One of his biggest wins was when he won the 2008 Aussie Millions Main Event and took home the $1,450,396 prize pot. Alexander Kostritsyn plays poker online under the alias joiso on PokerStars and PostflopAction on Full Tilt Poker. He is also rumored to enjoy playing in the online casino LeoVegas.